Right row- Aaron McCartan (Team Captain), John Wacker, Matt Dunfee, Alternate Mark Fullerton, Michael Lents. Left Row - Marty Flournoy, Brent Smith, Stan Moye, AJ Wilder and Alternate Angelo Cillaroto. 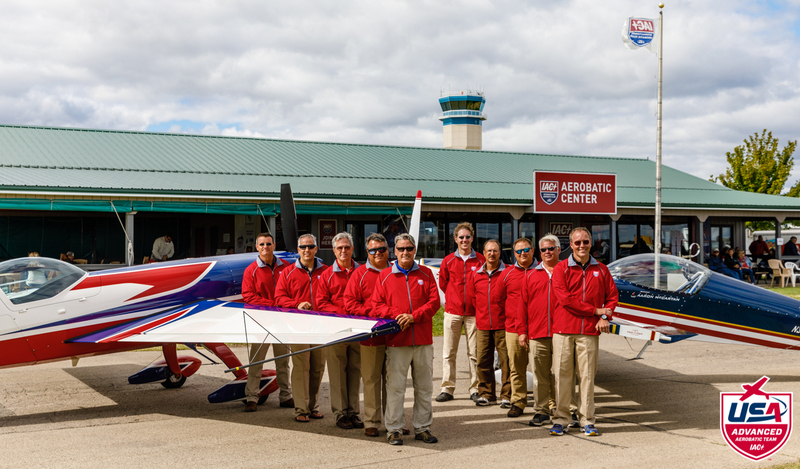 Team members will compete at the 13th World Advanced Aerobatic Championship in Strejnic, Romania from 15 Aug to 25 Aug 2018. $1000: Helps move a competition aircraft 500 miles closer to Ploiesti, Romania. $500: Helps sponsor the team's airfare to Ploiesti, Romania. $100: Helps cover the cost of fuel and oil for one day of training camp. $50: Help to cover the cost of world-class coaching at training camp.